It’s been 19 years since Elijah Price’s (Samuel L. Jackson) masterminding caused a tragic train accident in Philadelphia– a collision that killed all passengers except David Dunn (Bruce Willis), a secret real life man of steel. Considered a genius and danger to society Price is now kept sedated and incarcerated in a local mental hospital, Dunn functions as a security guard by day and a vigilante keeper of the peace by night. So, with the recent emergence of Kevin Crumb (James McAvoy) and his split 24 distinct personalities including the bloodthirsty “Beast,” Philadelphia is primed once again to garner attention in the superhuman arena, but not if Psychologist Dr. Ellie Staple (Sarah Paulson) can put an end to their “super” behaviors first, maybe there’s a rational and scientific explanation that might help these “delusional” individuals? Or not? Written and Directed by M. Night Shyamalan, this third and final installment of the mythic trilogy, a series many thought was shelved in 2000 after the first film, Unbreakable, was originally met with mixed reviews. Alas, down but not out, this latest offering delivers satisfying conclusions and twists to a story-line decades in the making, to that end, big props to Shyamalan for the execution, foresight, and long term planning in a way few Directors ever attempt. And, with solid performances from the ensemble the first two thirds of the film set up for something truly fantastic; sadly it’s the final third where follow through and payoff feels a bit less satisfying; perhaps it’s the now expected Shyamalan twist that carries less weight or perhaps it’s our expectations of what a superhero film should be, after all, we turn to comics and superheroes for hope and inspiration, it’s too bad the film does little to address those needs up until the very last minutes of an under-cooked final few brush strokes. 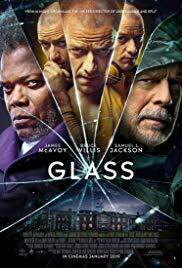 Glass is rated PG-13.